Councilor Barakas Taylor, hails from District One which encompasses the Interurban Height’s area, a hillside residential community centered around Ave F, Terrace Avenue, Myron Massey, portions of Gary Avenue, EJ Oliver Blvd, Grasselli Road and the Flint Ridge Commercial District surrounding. 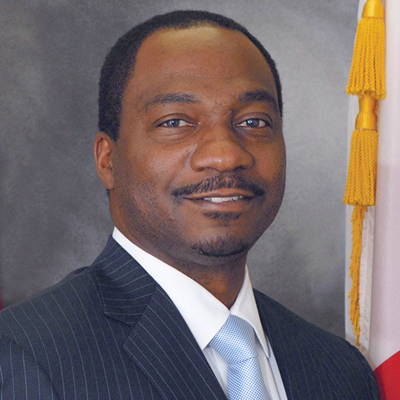 Councilman Taylor endeavors as a freshman Council Member with one of the most demanding responsibilities. He is Chairman of the Budget & Finance Committee where his role is to make recommendations regarding all financial matters of the City of Fairfield. Most significantly is the passage of a balanced budget annually, in accordance with laws relative to fiscal management. Recommendations are considered by the Council after departmental consultation and necessary for the approval of all appropriations. In addition to facilitating the billing process at the Council’s regular meeting, the Chair of the Budget & Finance Committee conducts hearings on the budget proposed by the Mayor each year. The Budget & Finance Committee evaluates and sets boundaries for the use of monetary resources, in-kind services and personnel. Councilman Taylor is also a member of the Public Safety Committee and the Telecommunications Committee. Councilor Taylor began working in the City of Fairfield in the Public Works Department in 1994. Pursuing a dream, he was hired by the City of Birmingham Fire and Rescue Service in 1999 and now holds the position of Fire Lieutenant at Fire Station #29. Councilor Taylor’s community involvement includes volunteer efforts as Vice President of the Fairfield Industrial Alumni Association. He has been instrumental in the organization of the FHS and FIHS Annual Reunion and the Alumni Picnic. Councilor Taylor is also a long time member of First Baptist Church Fairfield. Councilor Barakas Taylor looks forward to continuing his public service career as he works to revive the city he loves.